Will it turn into Hezbollah or return to its Cold War origins? Recently, profound changes took place within the Syrian Arab Armed Forces’ key command positions. It seems that the 2 nd Corps, once the occupation force of Hafez al-Assad in Lebanon, and the Republican Guard, one of the principal praetorian units of the Baath regime, will be under the spotlight in 2019. The reshuffle is more than merely a rotation decreed by President Bashar al-Assad. In fact, the Syrian military and its patron, the Russian Federation, have big trouble. At present, irregular formations controlled by profiteers, local warlords, and Iran-harvested Shiite foreign fighters badly outnumber the units that answer to the state defense and security apparatus in Damascus. Furthermore, Tehran’s day-after plans in Syria are pursuing the Lebanese Hezbollah model , namely building institutionalized proxies to create a state of permanent militancy. Besides, the Iranian Revolutionary Guards have started to gainsome influence over the Syrian strategic culture that has been historically shaped by the Soviet / Russian school. Overall, against the backdrop of Russian-Iranian competition in Syria, security sector reform remains a crucial agenda item. Moscow has to guarantee the unity and centrality of the Syrian Arab Army to translate its forward-deployed contingent’s military achievements into long-term geopolitical gains in the Levant. In doing so, some Russian experts have suggested reviving Syria’s three formal corps that existed before the war and turning these formations into territorial commands (resembling Russia’s military districts) to cover all armed groups, regular and irregular, in their areas of responsibility. Most probably, the 2 nd Corps, under the command of General Talal Makhlouf, hailing from the regime’s second important clan after the Assads, the Makhlouf family , will be the first experiment in this respect. The Republican Guard, on the other hand, could mimic the Russian Airborne Forces (VDV) as the independent strategic reserve of the commander-in-chief. To understand the future trajectory of the Syrian Arab Army, other major players to monitor are the 4 th Armored Division of Maher al-Assad, the Tiger Forces of the Russia-backed General Suheil al-Hassan , and the Air Force Intelligence commanded by General Jamil al-Hassan . The recent reshuffle, at large, reflects Russian efforts to reform its client, Syria. The most notable change took place in the Republican Guard. General Talal Makhlouf, the cousin of Bashar, was replaced with General Malik Alia . As mentioned above, General Makhlouf, who had commanded the praetorian unit since 2016 , was assigned to the 2 ndCorps commander post . Up until recently, Major General Talal Makhlouf, Major General Zaed Salah, and Brigadier General Malik Alia formed the trio that commanded the Republican Guard. Pro-regime sources welcomed General Alia’s promotion and highly praised him, especially due to his combat record in Aleppo. His 2016 interview with the ANNA News(the pro-Russian, Abkhazian news outlet that sends reporters embedded with the Syrian Arab Army to areas of operations ) was widely circulated in the social media. The Republican Guard is a critical agent of the Assad rule. The Makhlouf family has traditionally held top command posts in the Republican Guard highlighting an integral aspect of the intra-regime balance of power. Adnan Makhlouf, late Anisa’s first cousin, was the first commander of the guards during Hafez al-Assad’s tenure. The Republican Guard depends on a sectarian framework. Its manpower mostly come from the ruling Alawite sect , usually from the Kalbiyya tribe to which the Assad family belongs. There were few exceptions though, the most notable Sunni figure being Manaf Tlass (the son of Hafez al-Assad’s trusted defense minister Mustafa Tlass, and once a good friend of Bashar) . However, Manaf was placed under house arrest at the outset of the civil war and eventually defected. Hafez al-Assad designed the Republican Guard to function as a robust internal security tool. Its headquarters, like the other major praetorian formation, the 4 th ArmoredDivision of Maher al-Assad , is in Damascus. While the 4 th Armored Division (with its deployments in the Mazzeh military base) protects the southern gateway of the capital, the Republican Guard’s core area of responsibility has been the northern axis centered around Mount Qasioun. The guards have always been kept at full strength and provided with the best available inventory. Before the civil war, the unit was tantamount to a well-equipped mechanized division . When the civil war broke out, many of its subunits were deployed in different parts of the country in battalion and even company size. Besides, some Republican Guard detachments were attached to the regular Syrian Arab Army formations to maintain discipline. To date, the unit has fought in all corners of the country from Damascus to Aleppo and Deir ez-Zor . Finally, the Republican Guard exerts control over the bulk of the pro-government Shia militia LAFA (Liwa Abu al-Fadhal al-Abbas), despite the very fact that Iran orchestrates Syria’s Shiite militancy at large. Without a doubt, General Talal Makhlouf’s new post as the commander of the 2 nd Corps also deserves attention. As discussed earlier, the Makhlouf clan is one of the strongest players among the ruling elite. The wealthiest member of the family (and Syria), Rami Makhlouf, remains the main actor in bypassing sanctions on behalf of the regime. Besides, his al-Boustan “charity” foundation has long been sponsoring pro-regime armed groups. The 2 nd Corps was known as Syria’s occupation force in Lebanon until the 2005 Hariri assassination and the Syrian Arab Army’s subsequent withdrawal. Among subunits of the 2 nd Corps, the 1 st Armored Division and the 10 th Mechanized Division are the two primary ones. Back in time, the 1 st Armored played an important role in preventing Hafez al-Assad’s brother Rifat’s 1984 coup attempt. It is highly likely that General Talal Makhlouf’s assignment is linked with Russia’s plans of restructuring the Syrian Arab Army to prevent “ institutionalized warlordism ” which would play into the hands of Iran. The 2 nd Corps could pioneer the transformation of corps formations into broader territorial commands. Apart from the reshuffle, it is equally important to check those who kept their posts. General Suheil al-Hassan, Russia’s favorite military figure and the commander of the elite Tiger Forces, and General Jamil al-Hassan, chief of the Syrian Arab Air Force Intelligence Directorate , have kept their positions . The latter had assumed his post back in 2009 and has well exceeded the age limit for retirement . Even more importantly, the veteran Air Force Intelligence chief implicitly criticized Bashar al-Assad’s initial approach to the conflict in a 2016 interview with Sputnik Arabic , but managed to keep his grip on power. Given the Syrian regime’s record, the interview marked a sharp exception. At the time of writing, some sources reported that Jamil al-Hassan was hospitalized after a stroke , although the claims could not be confirmed. All in all, General Jamil al-Hassan represents the old guard that cannot be easily replaced. General Suheil al-Hassan, on the other hand, belongs to the new generation. He is highly decorated with Russian medals and an iconic sword presented by the Russian Chief of Staff General Valery Gerasimov. Furthermore, during his visit to the Hmeimim Base in December 2017, President Vladimir Putin personally addressed Suheil al-Hassan before Bashar al-Assad. No one could imagine this very telling scene during Hafez al-Assad’s tenure. Open-source pieces of intelligence suggest that an elite Russian security detailhas been accompanying the promising commander recently. Russia’s plans for the Tiger Forces in the postwar era remain to be seen. One could argue that Russian military advisors could transform General Suheil al-Hassan’s formation into a rapid reaction force. Interestingly, General Aous Aslan, a prominent military figure who was pointed out by some opposition sources as the Kremlin’s candidate for replacing Assad , was relieved from his command post and appointed as the Deputy of Operations. He still has a high position in the chain of command, but not a combat unit directly at his disposal. Maher al-Assad’s position as the commander of the 4 th Armored Division has remained unchanged. Following a period of being sidelined in the General Staff, Maher was appointed as the commander of the 4 th Armored in April 2018, at a time when General Suheil al-Hassan assumed the operational command of the east Ghouta offensive at Moscow’s behest . Thus, his promotion was interpreted as the regime’s efforts to counter-balance General Suheil al-Hassan’s uncontrollable rise. Finding a place for Maher al-Assad in the postwar era would not be easy. He would probably refuse answering to any formal chain of command. Some Russian assessments even considered Maher to be “ one of the key conduits of Iran’s interests in the Syrian leadership .” One thing is clear, if he perceives any threats to his personal security, nasty things can happen in the capital. In fact, looking back to the Hafez al-Assad era, brothers’ quarrel is not alien to the Damascene power struggle. Of the Cold War Soviet allies in the Middle East (Iraq, Egypt, and Syria) , the Syrian Arab Armed Forces most closely resembled the Red Army in tactical approach, organization, doctrine, and operations. The 1973 War witnessed Hafez al-Assad’s forces’ efforts tomimic the Red Army-style echeloned attacks with a central role for tanks, coupled with a special emphasis on air defense as a separate branch, although the regime’s character left little room for tactical-level commanders’ marge de manoeuvre . The military, shaped by the dominance of praetorian units with pronounced Alawite sectarian identity , has always been the central pillar of the Syrian Baath regime. Hafez al-Assad’s legacy has also led to a Soviet-fashion oversight of several intelligence agencies over the armed forces. 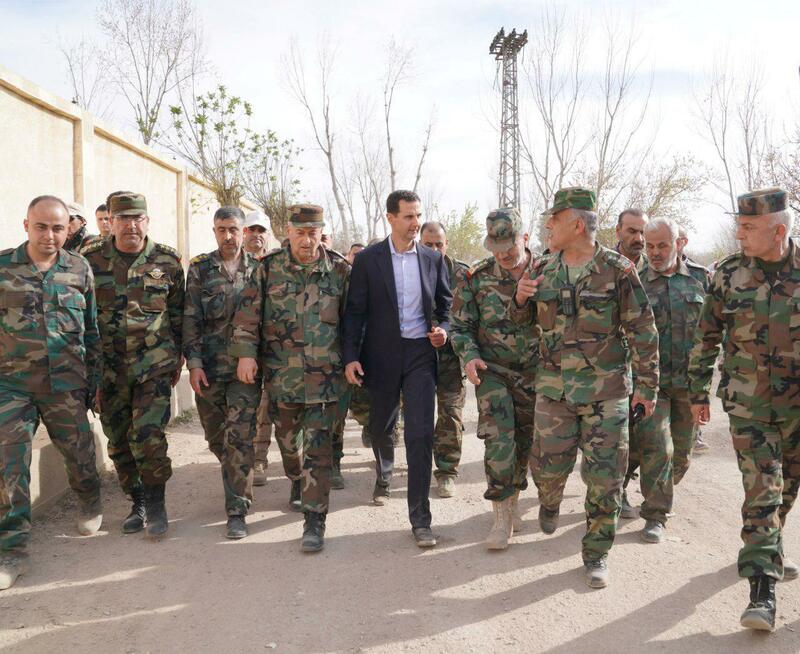 Besides, Assad’s rule has built a tailor-made military housing system for the officer corps, especially for those staffing the elite units, which linked almost every aspect of their lives to the regime. Overall, these factors have prevented a total collapse of the Syrian Arab Army , as well as en masse break of conventional formations, although defections plagued the bulk of the infantry. The trajectory of the Syrian Arab Army will conclude what postwar Syria would resemble at large. After all, one should recall that the Assad family has seized the political power through a coup d’état , and the Baath regime has always depended on the politico-sectarian design of the military. The Syrian Arab Army either will return to its Cold War origins or will have to be overshadowed by Iran’s proxies.